Wow! It’s been a long week (and a few days) and I have to admit, it’s been a little hard getting back into the swing of things in terms of work BUT I’m finally back! And I’m back with a tasty recipe for you guys. Let’s get right into it. 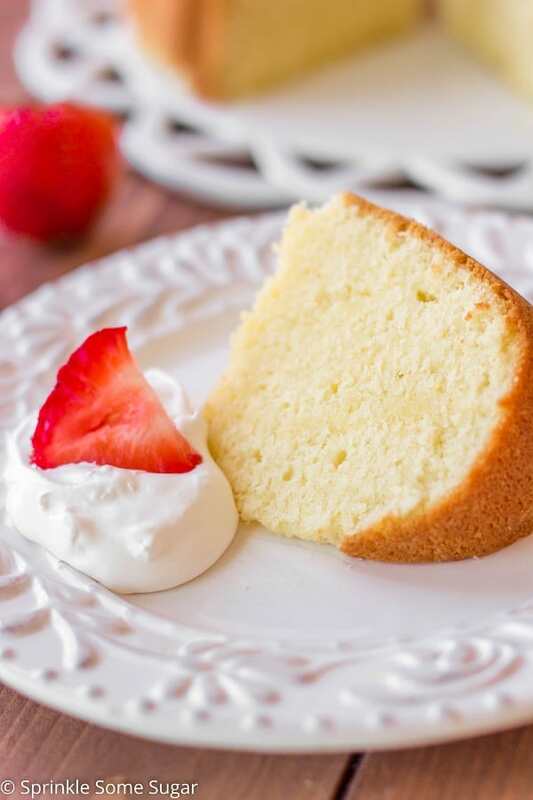 If you have been searching for the perfect pound cake recipe, look no further. This pound cake is one of my favorite cakes I’ve ever made! Like, ever. And that’s a lot coming from a chocolate-loving girl. I deem this cake the HOLY GRAIL of all pound cakes. It’s buttery, it’s rich and every bite gets better and better. You know those desserts you make and you have a little sliver here.. a little sliver there and before you know it you ate practically half of it? This is one of those desserts. It’s insane how addicting this cake is! My family and I loved it so much that I made it 3 times in 2 weeks. That’s a lot of cake! All of those calories were so worth it though. Speaking of calories, I wouldn’t even dare to calculate them for this cake but trust me, like I said, SO worth it. It’s okay to indulge every once in a while! I am obsessed with the texture of this cake. The texture is velvety smooth with a very light crumb but very dense like a good pound cake should be. It practically melts in your mouth. While this cake is ridiculously delicious on it’s own, I love using it in a plethora of desserts. One of my favorites is strawberry shortcake. I absolutely love this recipe, the only thing I change is I make homemade whipped cream and triple the amount. OH MY GOD, insanity. You need to try it. And that reminds me that I really want to make that this weekend for the BBQ’s! When I say this butter pound cake is good, it is goo-ooood. Add eggs one at a time beating very well after each addition, at least one minute per egg. This step is crucial for the best texture. Add vanilla. Incorporate flour and mix until just combined. Do not over mix! It is good to indulge every now and then. I would love to indulge in the cake right now! I have some fresh berries that would absolutely love the chance to sit atop a piece of this pound cake, Jessica! Oh this just looks so perfect. 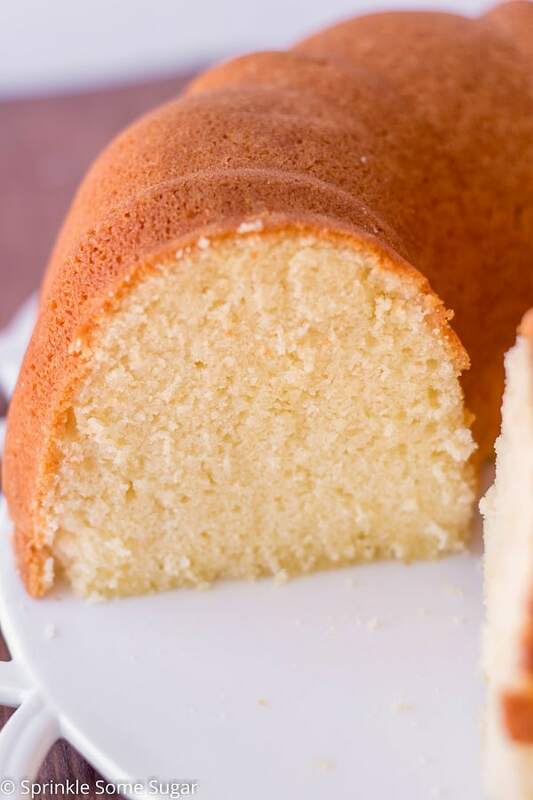 I adore pound cake and I had no idea how simple it was to make. Pinning and will be trying this soon! Lots of butter and sugar are always the basis for a decadent treat! A pound cake is always welcome for dessert! I love a good old-fashioned cake like this so much!! I’ve never made homemade pound cake, but this look so rich and delicious!! This looks perfect, I hope you saved me a slice! This cake is so yummy! Its very simple and straightforward! Thank you for the wonderful recipe!! You’re very welcome! Glad you loved it! Hmm, I am unsure why that happened. When mine bakes, it does rise above the pan slightly, but never into the oven and it comes right back down when it cools. I’m glad you still enjoyed it, Mary! I’m trying this cake for the second time in a week. Very good cake. But my first one cooked out of the pan into the stove?? I made this cake and you need a large Bundt pan. After reading everyone review’s I did not fill my Bundt to the top. I put the remaining batter in another Bundt pan and the cake was delicious. This is the best pound cake recipe I ever tried. I am purchasing a new pan, much needed. Does it need to cool completely before turning it out of the pan? No, it does not need to cool completely. I like to just allow it to cool for at least 10 minutes in the pan before I invert it onto a cooling rack to finish. I’ve tried the apple caramel crisp and it was amazing! I would love to try this! But is it a must that I use a bundt pan? If not, what would be the size of a regular baking pan that I should use? Thanks for sharing your stunning recipes! Thank you so much Yousra, you are too sweet! 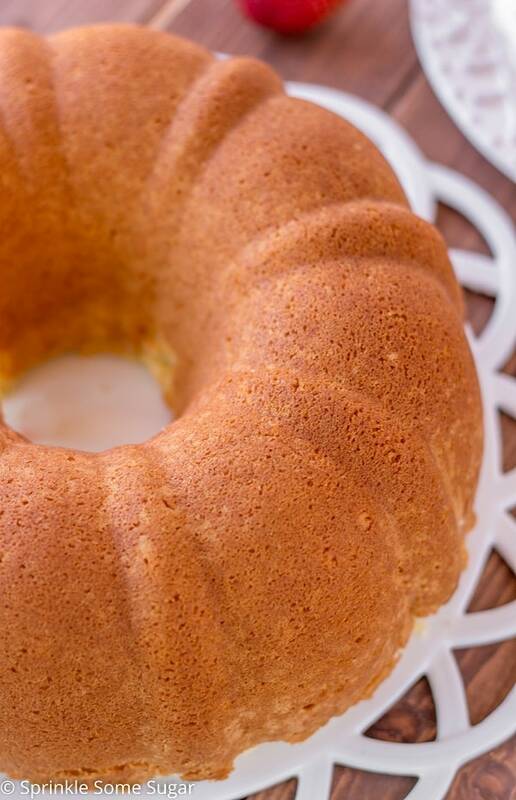 You can bake this pound cake in a 9×13 pan or two standard loaf pans instead of a bundt pan. This cake is so delicious. Best buttery, homemade pound cake ever! It was half gone in one day. It did bake up over the top of the bundt pan and down on to the bottom of the oven as others mentioned. It may have something to do with the size of the bundt pan. The spill lifted off easily with a plastic spatula after the oven cooled. Hi, I tried this recipe and I found this cake awfully sweet, however the texture and density of the cake was really good, just the sweetness was overdone. I think 3 cup sugar is a lot for this cake. I just recently made this cake, and it OVERFLOWED in the oven. I used just a standard sized bundt pan, but the cake ended up being unsalvageable. Any advice as to how I might avoid such a large overspill? I know this sounds absolutely cliche, but I really did follow the recipe!! I am so confused why it overflowed!! Oh no, I’m sorry this happened! I am unsure why this happened to you. It is normal for the cake to rise a bit above the pan towards the end of baking, but should not spill over the sides. I am just as confused as you are! Lol. Sorry I’m not much more help! I’m trying the recipe now I missed the step about the cold oven I had already turned oven on hope it will be ok fingers crossed. It is rising above Pan hope it does not spill. Hope it turned out okay! Maybe you added to many eggs. I don’t see baking powder in the list of ingredients. Is that correct? So excited to try this recipe! Pound cake is my FAVORITE! Yes, it is correct. The eggs are the “leavening agent” in this recipe. I made this cake. It came out perfect. Have not cut it yet. This cake is amazing! I used 2 round pans to make a bday cake and it did go over a bit but no actual overflow so probably should have left maybe half a cup of batter out of each pan, but I just had a little extra crunchy goodness. I also did the AP flour & cornstarch mixture bc I did not have cake flour. This was amazing and easy, thank you! Thats so amazing to hear! I would not have thought to make this as a layer cake, bet it was delicious! Came out perfectly. I topped it with a lemon and powdered sugar glaze. I cannot find cake flour here. Can I use self-rising cake flour instead ? All purpose flour may be too heavy for this cake, as it is already a dense cake. The cake flour gives it the soft texture. I made it last night with all purpose flour, half almond flavor and half vanilla flavor for the tablespoon of flavor, only 2 cups of sugar rather than 3, and it was still delicious, like moms! Thanks! I made this cake today. It looks great and taste delicious, but when I cut it some of it looks wet. I wish I could send you a picture. I followed the recipe. Will you please give me tips to keep this from happening? Hello, what size pan did you use for this recipe? I just baked this, though I added the juice of a lemon and 2teaspoon baking powder.